Lisa, I have just looked at the testimonials in your web site. I'd like to add mine if you want to put it in. You know when I was pregnant with Lisa, I came off your products and did not get back on anything until after she was 10 months old. I decided to start back on the HGH Plus, Estrogen/Progesterone, and Multi Plus as by then my weight had increased to 68 kg (I was wearing size 12-14 jeans) and I started to lose my thick dark hair which I had grown after taking your products. Again great miracle. For me well my hair is very thick again. And guess what? I weigh 56kg meaning I am back in my size 8 jeans. I am just so happy. I will need to give away all the size 12-14 clothes in my cupboard. In fact I have already distributed a few. What can I ever say, I am ever so grateful. And I will continue to pray that more people come to appreciate your products because they are the best and affordable. All I can say is, we are so blessed to have found you to supply us our needs. We will continue with you as long as we can. God bless you and take care and I'll be in touch. I have been using the HGH Plus IGF-1 for about a month now and I can tell you it has been nothing short of astounding! I've lost almost all the weight I gained over the winter and already look like I have been lifting weights again. I can't wait to see what happens when I do actually start lifting... which I now finally have the energy to do. I've also been sleeping better than I have in years (I usually have chronic insomnia), and wake up much easier than I did before. I noticed the sleep improvements within a matter of days, and the weight loss and improved energy/muscle mass started about a week into it. Thank you so very much! I just wanted to tell you how impressed I am with your HGH plus IGF. I had quit smoking 3 weeks before starting this product and I have been using it for 3 weeks since then. The visible changes alone have given me the willpower to continue to stay off of cigarettes. I am 45 years old and now in the best shape of my entire life. My skin has tightened up and I have gained weight in muscle mass, something I have wanted to do for years. I purchased exercise equipment and in just one week I have added an inch to my pecks and biceps alone. My old herniated disc bothers me less and less, my energy level has increased tenfold, and for the first time in I don't know how long I feel great and feel better about myself! Bottom line is that I wouldn't know what to do without your product after seeing what it has done for me. Thank you!! Dear Lisa, I first spoke to you in October and explained my MANY problems: insomnia, EXHAUSTION in part from hypothyroidism, glaucoma, hair loss......after talking to you and reading some of the testimonials on your web site I ordered the three month's supply of ProBLEN HGH Plus IGF-1 and began using it as per your instruction. I also began taking your Multi Plus vitamins. IMMEDIATELY I noticed I was sleeping better, waking more refreshed, having WOW VIVID AWESOME DREAMS and not having that horrible "hit the wall" exhausted feeling slam me. I was diagnosed with glaucoma in January 2003 and began using Xalatan drops every night to keep my pressure under control, but almost every day I was in pain, my left eye, the one with the highest pressure, hurt almost constantly for my entire waking day. Shortly after beginning my HGH treatment THE PAIN DID NOT LESSEN IT JUST DISAPPEARED! I have only had ONE painful eye day since beginning your product and that is my fault, I missed two doses in two days. I return in March for a re-check and it will be interesting to see if my pressure is substantially lower now that I am using your product. Here is the most amazing fact thus far! As per your suggestion, I had my TSH tested right before beginning treatment, and my level was 3.5.... I have been in disagreement with my NP about where my level should be, she says "you are fine" when my level is that high but I feel better being at maybe 2.3 or lower. ANYWAY, I just had my TSH level checked again this week but had the doctor order the test not my NP. So today the office called me and said my results were in, did I want to come by and talk about them? I had told my doctor prior to my blood work that I was taking your product, and he said "I will be interested to see your results". TODAY MY TSH LEVEL WAS 1.68 the lowest it has ever been!!!! So as soon as I get home from work I am going to order another three month's supply and more vitamins! In case you could not tell, I am THRILLED with your product and the results. Dear Ms. Wells, I have been taking the ProBLEN HGH + IGF-1 for two weeks and am seeing a very noticeable difference in my skin texture. Also I am noticing a pickup in energy level. Thanks for providing such a fine product. On March 13 I started to use ProBLEN's HGH Plus IGF-1. I had told you I was on OMEGA GH ONE. On OMEGA I got home in the afternoon so tired that I had to lie down. I do exercise and am on a diet consisting of mostly fish, skinless chicken, and vegetables. I had been placing two sprays 3 times a day under my tongue, no taste, actually nothing happened. In March I decided to try your product, it works. I first realized the tingle under my tongue and it had a taste to it. I also take your Multi Plus multivitamin, multimineral product. Since taking your products I sleep very well and last night I was dreaming, I have not done that in a long long time. It feels great to have energy to waste (grins). Thanks again for your help. My girlfriend in Germany, we telephone every day, says Nick, what's happened, your voice is so clear? I sure like to hear that. Thanks Lisa for taking the time on the phone to explain. I really like the ProBLEN HGH Plus w/ Velvet Deer Antler, DNA, and Estrogen & Progesterone products - makes a big difference especially in my weight training and mood swings (rarely have them now). I can really see and feel a difference these past few months now that I am free from all medication. Feel free to use my words as a testimonial. 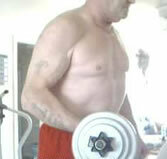 You can also add that my workouts have been more efficient and effective since using the HGH w/ IGF-1. I get more from my workouts and I feel pumped and energized all day after exercising in the morning. It has also improved my overall attitude and mood, I feel I can take on the world. It has also improved my sexual performance and enjoyment. Let me know if you need more. Lisa, I just want to say thank you. My husband and I have been taking your human growth hormone product and after one month people are asking how am I am getting younger at 50 years old. My husband's hair is losing his gray and going back to dark brown. We are losing weight and our arthritis is going away. This is just a few of the changes. I guess it is obvious that we feel allot better. Thank you. I last bought 3 oral spray bottles of HGH Plus IGF 1. I have been taking as directed. If you check your records for my date of purchase, it should be about a month ago. I don't know whether it is psychosomatic or true results; however, I am feeling more energy, sleep better, and have a huge wave of sexual desire that I had not had in some years. I just finished the first bottle, and yesterday started on the second @ three two spurt sprays a day. I am writing to let you know how much better I feel since taking your product. I've been taking it for almost 3 months now and the improvements have been astounding. After a little over a 2 week period I woke up one morning realizing that I had slept soundly all night long, the first time in over 3 years. This was just the start, my sleep became more like it used to be when a teenager and once comfortable in bed soon drifted off and did find I was remembering having dreams which I hadn't had for a very long time. Also, shop assistants starting commenting on how lovely my nails were. Being a housewife I hadn't looked too closely as my hands never seem to be out of the sink. They were very strong. My scalp seemed to have moments of itching and after a while noticed amongst my long hair there were some areas sticking up which were shorter in length, can only presume this is new growth from my previously thinning and brittle hair. I care for my husband full time following a stroke and have moments when everything seems to get on top of me but since taking HGH and IGF-1 I have found I am much more able to cope with stressful situations, it is rather like walking around and noticing more about me with a feeling of winter has passed and spring is here. I believe I will see further improvements in my health. It's like the ProBLEN is working its way backwards through my problems. The sleep is now in hand. Hair and nails much better. Had several months ago restless legs in the night with cramping, this initially came back for about 3 days but passed as though the ProBLEN had unblocked a channel and is making things run smoother. For many years I have tried every diet formula, most supplements and new on the market products as I have overworked myself in my career (working 6-7 days a week and up to 18 hours per day) divorce, moving house (several times) bereavement etc. over a 30 year period gradually getting more and more weary but for the first time ever can honestly say this is the first product which does not lie about it's claims of potential benefits. We all heal at a different rates, and I believe this is what is happening to me. I am about to order my second batch and look forward to experiencing a much fuller life now that I am reawakening. My thanks to Lisa Wells for the time taken with my queries and the care and understanding shown with them. Kindest regards, Carol in the UK. I have a problem with the circulation in my legs, with much pain in the muscles, swelling, varicose veins, discoloration marks such as purple patches, etc. After taking the HGH Plus for 3 days my legs were substantially improved, with the swelling and discoloration almost gone and the circulation drastically improved. I went on a trip and was able to sit on a plane for 5 hours, which is remarkable. My legs were not swollen or painful for the first time in ages. My friend who was with me on the plane saw my legs and was amazed. I have not seen many testimonials about the cardiovascular benefits of this product so I wanted to say that the cardiovascular benefits I am receiving are outstanding. Now that my legs are so improved I am noticing just the pain in my knees. I am hoping that will be the next thing that is improved. I was able to clean and paint an entire room, which we find unbelievable for me! Lisa, You asked me to let you know if I noticed any improvement in my physical state after starting use of your product. At this time I have been using HGH + IGF-1 for eight months so hadn't expected much in the way of new changes. However I have one wonderful report that I can only credit to these products. Please, bear with me. Five years ago I suffered a retinal tear in my right eye. Visually I had a rather large black circle centered in the visual field of that eye. For two years I had to put expensive drops into that eye from two bottles and an additional year from one bottle. They finally got the pressure in that eye down to an acceptable level but not quite normal. I was left with distortion of wavy lines across a circle centered in my vision covering about 20% and told there was nothing more they could do for me. The very best they could do for me in the bifocal range was 20/40. December 3rd I had my annual eye check. The bifocal range is now 20/20 and I could read all but two letters in the very last line of the chart. The very wavy lines have been reduced to slightly wavy distortion. There is absolutely nothing I can attribute this change to except your product. If I need to do anything else to get my shipments restarted please just let me know. My mom went for a follow up eye exam for cataracts, etc., and the week before she was told if it was any worse he'd have to declare her illegal to drive in Florida. One week later, her eyesight had "magically" improved and she can now drive in the daytime, this after 2 doses of the HGH. She said she'd thought it was her imagination that her eyesight seemed better. I just noticed something and thought you'd be interested. In 1983 I was carrying some bottles to the store on my bike. I fell off the bike and cut my right little finger very badly and severed the nerve. Since then I have had no feeling in the cut area of the finger and whenever I would touch it, it would tingle. Well just a few minutes ago I noticed as I was doing dishes that the white scar that was left from the accident is almost gone. I was kind of caught off guard. I inspected it further and realized, to my amazement, that the feeling had returned and the tingling was gone! I certainly didn't expect anything like that! 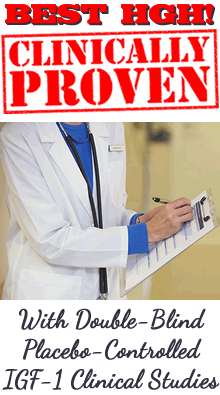 Your HGH + IGF-1 sure is the real deal! Thought I'd take a few minutes to let you know how things are going now that I have been using HGH w/ IGF for 4 months. I immediately noticed a significant improvement in my lower back discomfort that I have been dealing with for several years. Seems like I would pull a muscle every month or so and have to cut back on workouts. I have now been injury free for 4 months. I am an engineer by profession and with heavy workloads and two little girls stress has been a major factor for me. Since taking growth hormone my ability to deal with stress has improved dramatically. I no longer have large swings in emotions and stress levels. I think most of that comes from a significantly improved mental state. The clarity of thought process feels like late 20's to early 30's but with the experience of a 43 year old. What an awesome combination! Sleep has improved dramatically. When I lay down at night I go right to sleep and sleep very soundly. Instead of one or two nights a month of good sleep, I now get all but one or two nights of great sleep. This has translated into better workouts and more productive days at work. Thank you for taking the time to assemble and explain the benefits of your products of well as the confusion of other claims. Your web site is a wealth of information. Your friend for life. I asked my friends to measure me and after several attempts they all agreed that I was now 200 cm tall!! I was 198 cm tall at 21 years of age and I have just turned 42 years old! Don't we usually lose height as we age? I'm glad that everything went well with my order. Other than that, I have been your loyal customer for 10 years because I feel that your products are very good, make my body work better. I started using HGH w/IGF1 and IGF2 at the beginning of January. I've just passed the 6 month mark and I noticed something I hadn't been paying attention to. I have had a toenail fungus on my right foot for several years and was reluctant to use the pharmacy drugs because of possible kidney damage. Well, now i don't have to. The nails on my small toes have cleared and the nail on my big toe [which IS big--I'm over 6 ft.] is 3/4 clear. This in addition to an overall general feeling of better health. I'm 56, by the way. I'm very much looking forward to what comes next. Thank you for your products. I knew I would be providing "results feedback" after only one week! I have experienced the following results, some in milder form than others, but ALL wonderful! I had been daily taking pain and anti-inflammatory medicines for lower back and pulled hamstring conditions...I just realized that I haven't taken any of either for about three days now! Yesss! Well, that is plenty of "testimony" for now, I would say! I will check back in another three weeks, when I hope to report some loss of inches from my body! As I am sensitive to all medications/supplements, I am still experimenting with dosage. I am having a few heart palpitations at night and feeling a little hyper during the day. I love the product, though. thanks. The 'biggest' change in me, so to speak, has been a gain in AN INCH AND A HALF in height. I've started a 'measuring wall' where I check every two weeks now! I really couldn't be happier. I am a new customer and wanted to e-mail you to let you know that I decided to purchase your products based on your obvious (and excellent) desire to inform and educate existing and potential customers. I am a real believer in human growth hormone therapy and have tried a number of competitive sprays and have always been left with the feeling that I bought the hype and did not receive the benefits the products promised. I have decided to try one more time, with you, because of the quality and sincerity of the product information you have provided. I look forward to the benefits of restored HGH levels and want you to know that you are one of a few who seem as interested in sharing a good thing as you are in making a buck. I started taking the HGH Plus IGF1 & IGF2 product on March 20. I wrote to customer service before ordering, being wary of websites that offer customer service and refunds but don't ever get back to you! Lisa Wells, RN sent me such a personal and touching message that I was quite confident this business would stand behind its guarantees. I have been experiencing tinnitus for at least a couple of years (possibly longer, but I used to go to concerts quite often and thought it was just an after-effect)-- not to the extent that it interfered with my day but it was quite maddening when I was trying to fall asleep. Sometimes I would hear a little "pop" and the tone would change to louder & shriller or sometimes a little lower. Anyway, 2 or 3 nights after I started the HGH, I was in bed hearing a shrill sustained tone, then I heard a little "pop" and it became so low & quiet I could barely hear it. Since then I have checked several times; when all is quiet and I'm holding my breath and cupping my hands over my ears, only then can I hear the faintest of tones...but it certainly doesn't keep me awake! Also in the past seven months since my boyfriend died a horrible accidental death I have been having nightmares and pretty much been terrified of falling asleep. I used to quite enjoy the process of falling asleep and sometimes would even go to bed early so that I could relax, think and "daydream" until I just transitioned into sleep. The last few months I have dreaded that stage, because I would generally start thinking about death and suicide and cry myself to sleep, or get up and (I'm sorry to say) eat, drink alcohol and watch TV until I just passed out...usually around 4:30 in the morning, and then I would have nightmares and wake up around 6:30 or 7:30. A few weeks before I started the HGH, I was able to establish healthier sleeping habits but was still having nightmares (a particularly disturbing, disgusting one the night before I received my order, in fact). I read on the website that many customers experienced "more vivid" dreams--which didn't sound so good to me, considering the kind of dreams I've been having! But I'm happy to report that I haven't had any nightmares in a whole week! I really, really hope that this product will help me lose weight as that is my main short-term concern. One week is too soon to say anything about that, especially since I had my period this week. Interestingly, it started 3 days early, and was quite heavy but was about a day shorter than usual, and I DEFINITELY experienced only about 1/2 the pain, fatigue, and weepiness that I usually do. Lisa, I do feel that there have been positive effects from the use of your product. The more I learn from you the more understanding and trust I have in all the products you represent. I have read your bio and now with these few contacts I have had with you by phone I believe in your spirit. I have found you refreshing, inspiring and interested in people and their needs. I'm happy to let folks know how good this product is. I just realized that I did not have to take a nap today, for the first time in about 10 years! Now that is really something. I found myself working past closing hour and what a lift that was. We a group of three guys, formerly elder, feeling as having an age of about 30 years thanks to your great HGH-IGF-1 product. One of us threw away his glasses after having used your product during 5 months. His doctor checked whether his technical equipment worked well because he could not believe it. An other one has divorced from his wife and is enjoying life as if he would be 25 years old. The third one had interrupted to take your product after two months. Now he is thinking about rejoining us because of the fantastic effects he has to remark looking at our development. Thank you for all what your famous product has yet done for us and what it will do for our wellness and health in the future. Best regards and greetings from Munich, Bavaria (Germany), Thomas. Well, I finally found some time to put my thoughts to paper (see attached file). Thanks again for all the questions you've answered over the past years and the content you provide to your customers on your web site. It's obvious you truly are trying to dispel the myths and help your readers understand everything about human growth hormone (without the hype). Believe it or not, it's now my two year anniversary with your human growth hormone product so I thought I'd take a few minutes to reflect on the changes I've seen over the past two years. The most interesting story for me was post-op for surgery I had on my shoulder. Back in 2000 arthritis that had developed between my collar bone and left shoulder due to weightlifting. Not being much of one for needles and cortisone shots I opted for orthoscopic surgery. The recovery went as planned. I was able to do some simple aerobic activity within a week and started lifting very light weights after about one month. It probably took two full months before I could raise my arm completely straight overhead with little discomfort. Fast forward to October 2002. It was becoming quite evident that my right shoulder was rather quickly heading down the same path (which is not uncommon for those who lift heavy weight for extended periods) so I decided to pro-actively have the surgery before it got as bad as the first shoulder. At this point, I had been taking your ProBLEN HGH w/ IGF for almost one and a half years. This time around my recovery literally took half the time and with significantly less discomfort. I was so amazed that I convinced myself the procedure must have changed during the two years between surgeries. At my follow-up visit, though, I discovered that not to be the case and the surgery was exactly the same as before! Based on all the other wonderful benefits I have seen from using human growth hormone I was left to attribute my quick recovery to the use of this product. I have always been a fairly healthy eater but nothing I could think of could have had such a significant impact on my recovery time. I still continue to sleep very well with only the occasional trouble getting to sleep (usually directly related to a problem at work). My work outs are awesome with soreness being kept to a minimum. Strength continues to improve as well as flexibility. My skin is softer and younger looking. My fingernails and toenails have gotten very clear and shiny. I can think very clearly and juggle more things at work than I could two years ago. I am still injury free from my once chronic back problems. Although I still see a chiropractor his adjustments are much easier and seem to last longer. Your web site is wonderful!! I am continually amazed by the content you've added each time I return. It is hard to believe it but my hair is starting to grow back! I thought I'd just update you. I am sleeping really well in the night. Very strange but very peaceful. Have not done that in months. I also have a lot of energy...I mean I am studying for my MBA and I can keep going till 1:30 early hours of the morning and it is so good. Strange, I wake up peacefully, you know no tiredness etc..may be I am reading too much in to it, but I really think it is working. Tomorrow is my off day from growth hormone. I just hope it gives me the full benefit I so desire especially with my hair growth. Just one thought though. My baby is still breast feeding and I'm just concerned that I may be sharing the strength of what it may do to help my system...hence lessening the effects for me. What do you say. I try to feed her before I take my dose, however, she still feeds let's say an hour or so later. Is it possible that the baby feeding off me will lessen the full effect? This must be a unique situation...or do you have mothers like me on your program. Any insights to share would be very much appreciated. Good night.